The “Two Lives in Art” exhibit displays the progression of Erik Christenson’s and Anna Kaiser’s artwork throughout their lives as single people into their art as a couple. 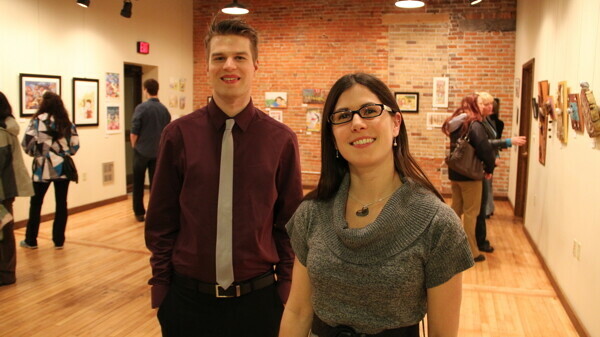 Local artists Erik Christenson and Anna Kaiser have put on several art shows in the Chippewa Valley and the Twin Cities. To them, every show is exciting. But their latest show includes a touch of something more special than usual. “We’re getting married and combining our work and our lives officially,” Christenson said. Their new exhibit, “Two Lives in Art: Anna Kaiser & Erik Christenson,” takes a look back. The show includes about 50 pieces placed in a timeline of their lives. “We’re doing a little section from when we were little kids, (another section) when we were in high school, a big section from college, after college, and current work,” Christenson said. Patrons will get to see the progression of Christenson’s and Kaiser’s creation of pieces throughout their lives as single people into their art as a couple. And that’s in part because of the couple’s similar styles and visions. A lot of their pieces include a variety of colors, outdoor scenes, and interesting characters and animals. Menomonie native Christenson and Kaiser, who is from Stratford, met at the Minnesota College of Art and Design, where they hoped to become animators. As time went on they both realized that illustrating grabbed their attention more. While their works of art have a lot in common that complement each other, the artists each have their own distinct inspirations as well. “One common thing through all of (my pieces) is that I’ve been influenced by movies and film. When I approach an illustration, I try to think, ‘How could this be shot in a movie?’ (That includes) the composition – how they make it interesting and cinematic-looking,” Christenson said. While Christenson’s thought process may seem more imaginative, his fiancée finds real examples of personal memories and nature scenes when putting pencil to paper. This somewhat practical inspiration is reflective on the type of pieces Kaiser creates, which includes illustrations as well as 3D representations of people and animals. 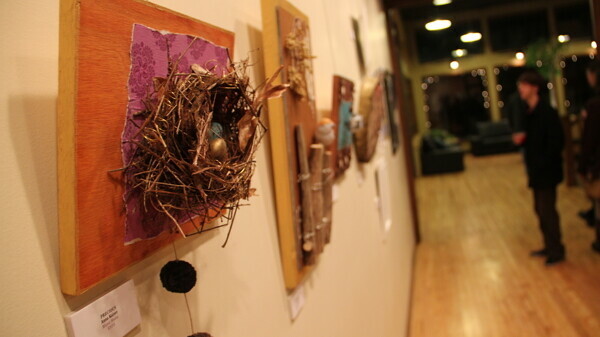 Before moving to Menomonie, Kaiser worked with injured birds in Alaska, which she said has influenced her work. “I experimented with different clays, and I carved out different birds that you would find in the area using wood and clay and naturally found objects that I found around the area, like pieces of rusty metal and old nails,” Kaiser said. Christenson and Kaiser live in Menomonie, where the top level of their house is the designated art studio. To the couple, one important part of the exhibition is to provide inspiration for other people, especially children who are interested in art. When going to art shows, Kaiser said some young artists might get discouraged when taking in the talents of experienced artists as they admire their work. 205 N. Dewey St., through Feb. 28.